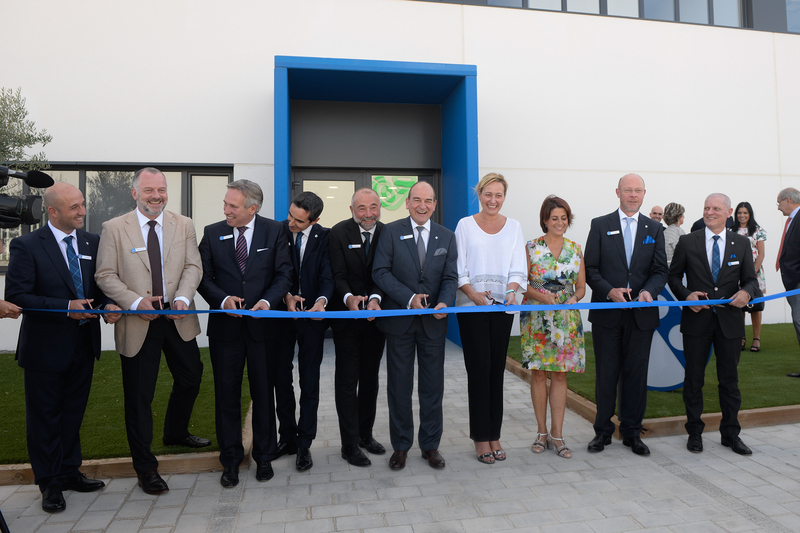 Teruel, 4 September 2017 ... Röchling Automotive has opened its second factory in Spain. A state of the art production plant has been built in Teruel, in the east of the country, on an area of ​​40,000 square meters, dedicated to the manufacture of technologically sophisticated plastic parts and components for the automotive industry. "Through this investment, we continue our growth strategy in the Automotive Division at high speed," said Ludger Bartels, CEO of the Röchling Group. Aside from the management of Röchling Automotive, the opening ceremonies were attended by a number of representatives from the city and the local economy. Erwin Doll, responsible for the Automotive Division of the Röchling Board, explained the reasoning behind the opening of the new plant. "We need to be able to respond in a flexible manner to our customer’s needs with a production site," said Doll. In Spain, Röchling Automotive was already in business in Araia (Álava / Basque Country). However, that plant was no longer capable of handling the increasing customer orders from the Iberian Peninsula. "Furthermore, with its location in Teruel, Röchling continues following its strategy of promoting internationalization and growth abroad," said Doll. Teruel is the 40th location of the Röchling Automotive Group worldwide. 16 million euros were invested in the purchase of the land, the construction of the plant and the machinery. The plant currently employs around 30 people, and it creates new opportunities for Teruel and the region of Aragon. "We are pleased that the Röchling Group has chosen Teruel as its new location to develop here. This is also an acknowledgement of our urban and regional economic policies and the unreformable strategical situation of Teruel,” said Teruel’s Mayor Emma Buj. Marta Gastón, Minister for Economic Affairs of the Aragón region, also spoke in favor of the impact of the plant. "The additional jobs will boost the local economy and help create jobs in the region," said Gastón. The procurement of raw materials, packaging and other goods and services will also have a positive effect on the local economy. The new Röchling Automotive plant was chosen as the "Project of the Year" in June 2017 by the magazine "Ejecutivos". Wheel arch liners, deflectors and design covers are produced at the Teruel plant for the car manufacturer Ford and its factory in Valencia. Cowl grilles will be added later this year. Active air shutter systems (Active Grille Shutters) and SCR tanks are also planned for 2018. "With our new plant, we can meet the increasing demand and at the same time reduce delivery times and logistics costs," explained Renzo Magnabosco, Commercial Director of Röchling Automotive Europe South. The new location is strategically ideal, as it is in the middle of a triangle and is suited to supply the GM plant in Zaragoza and Seat-Volkswagen in Martorell. "Additionally, the plants of Nissan in Barcelona and PSA in Madrid can be easily reached," said Magnabosco. Construction began in the industrial area of ​​Platea in August 2016, and by the end of March 2017 the works were completed. The foundation works were delayed by the cold weather. "We made up for this time loss through additional shifts over several weekends and completed the construction in a record-breaking six months,” reports manager Juan Antonio Martinez. Since May 2017 the production is running in a 3,200 square meter hall. There is also a 4,600 square meter logistics warehouse, a covered area of ​​1,800 square meters, as well as outbuildings and offices. A total of four 2-component injection molding machines are produced with a clamping force of 2,700, 1,300 and 650 tonnes. Four additional machines will be purchased in September this year. In the following years, the site is to be expanded further. With this in mind, Röchling Automotive has already registered an interest in an additional 40,000 square meters of space. "Experience shows that our newly built works will soon reach their capacity limits. We are ready for this," explains Luca Guella, Technical Director of Röchling Automotive Europe South. There are five more production machines planned from 2018 to 2019, the production plants will be nearly doubled, from 7,000 to 15,000 square meters. Röchling Automotive intends to reach full production capacity in 2019, and will have invested around 21 million euros. At this time, a staff of almost 100 will be employed. Finding skilled workers is a key challenge, as there are no other injection companies of technical plastics parts in the region. "That is why we have launched a comprehensive training program," says Tamara Tonioni, Human Resources Manager of Röchling Automotive Europe South. Within the framework of this program, the new employees will be further qualified for up to three months in the Italian town of Leifers, the headquarters of Röchling Automotive Europe South.